India is is rich with its splendorous temples, sculptures, cave painting, forts and palaces. However something that is quite intriguing with their mind-boggling architecture are the step wells of India. 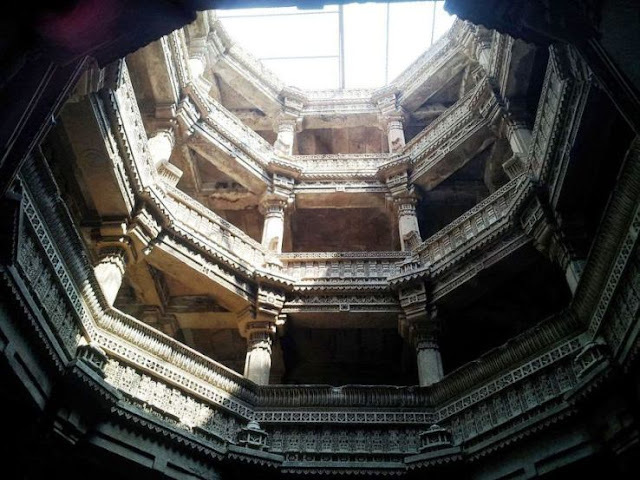 The ancient Indian architects and sculptors have taken the simple, utilitarian wells into another level so that they become architectural master pieces. Most of the step well in India are found in the western states like Gujarat, Rajasthan some part of north Karnataka and Delhi.They are known my different names. 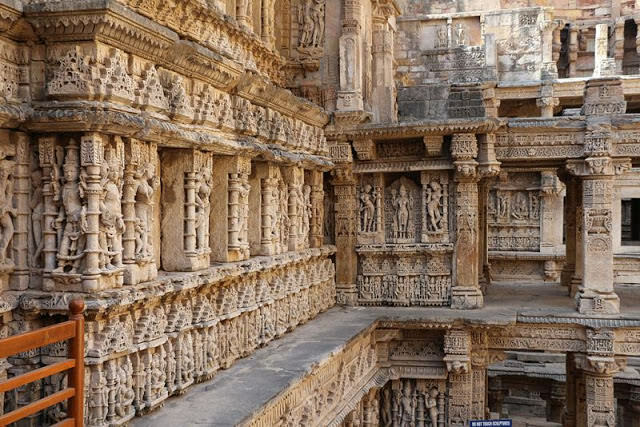 In Gujarat they are known as 'vav' or 'vavdi' where as in Rajasthan they are called 'Baoli' or 'Bawdi'. In Karntaka they are know as 'Pushkarini'. The step wells of India, unfortunately doesn't get as much attention as the other monuments. In regions where there is water scarcity, step wells were built making very deep trenches which becomes narrow as going down. The stairs were built in a symmetrical fashion on all sides of the well so as to prevent the land slide and make it easy for fetching water. Most of the existing step wells in India are quite ancient – built between 11th and 16th century. These wells were promoted by the Hindu-Mughal emperors. When the British came to rule, they abandoned these wells as they felt step wells fell short of hygiene standards. Even though most of the step wells are abandoned now, in the olden days these wells were quit lively as it was not only a source of water, but used as a place for social gatherings. The convenient steps on the sides of the Baoli and the wind cooled by the water at the bottom made it a favorite place for the villagers to meet and talk. Here is a list of the most famous step wells in India. 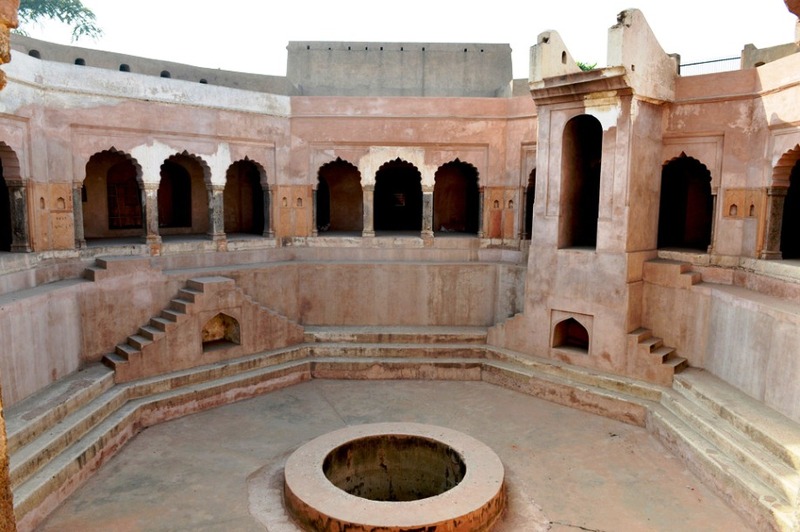 This is an enormous step well located in the Abhineri village of Rajasthan. It comes on a detour from the Jaipur - Agra highway. It is believed to be built between AD 800 and 900. It was initially dedicated to Goddess Hashat Mata. Remember the movie "The dark knight rises"? It looks like Christopher Nolan had taken inspiration for the notorious underground jail from Chand Baoli. There is also many balconies of Pavilion around the Chand Baoli, and also the reminiscent of a temple around it. Rani ki vav, or Ran-ki vav (Queen’s step well) is situated at the town of Patan in Gujarat. It is one of the UNESCO world heritage center in India. 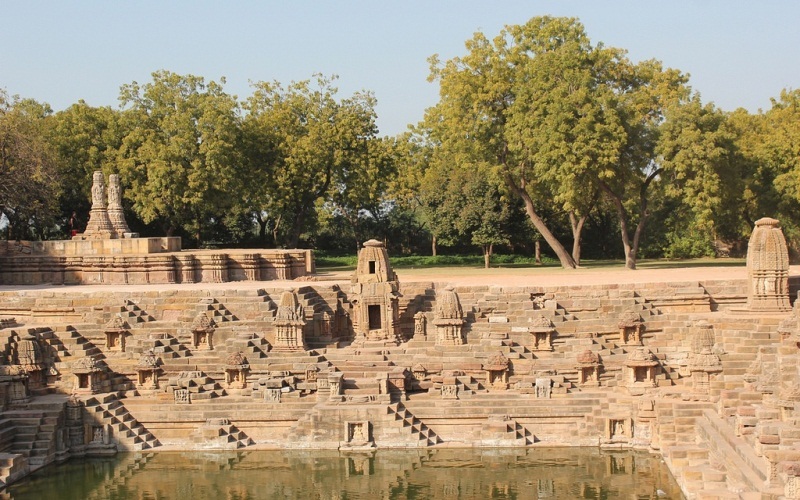 This intricate step well was built around 1050AD by the Queen of Bhimdev I of Solanki dynasty. It is 27m deep well with an intricate construction and beautiful carving featuring the Hindu Gods. 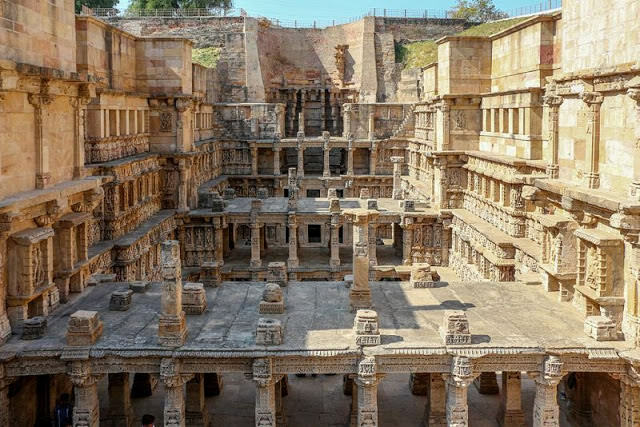 Rani ki vav was completely flooded when the nearby Saraswati River overflowed in 1980s, it as the Archeological Survey of India that excavated this site.This step well is constructed in Maru-Gurjara architectural style. This is step well will give you a vertigo if you look into it from the top. 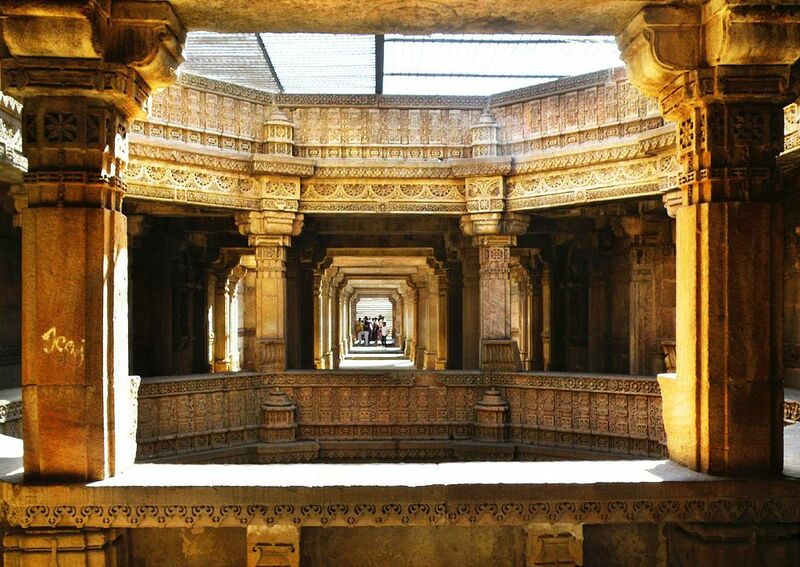 Dada Harir Vav is an enormous step well constructed in 1485, by a women named Dada Harir. She was a dependent of Sultan Mahmud Begada of Muzaffarid dynasty. This step well is built in the Solanky architectural style. It gives you a vertigo, doesn't it? From the top, it looks like an octagon and it has five floors. Just imagine the depth of the well and scarcity of water! The galleries around the well are adorned with beautiful carvings and there are stairs leading to the bottom of the well. Ducked inside the high rise buildings of the Connaught Place in New Delhi, there is an ancient step well named Agrasen Ki Baoli. There are no definite historical background for this step well. According to legends and as the name suggests, it is believed to be built by Agrasen, a King who ruled during the Mahabharat time (may be in BC 3000). 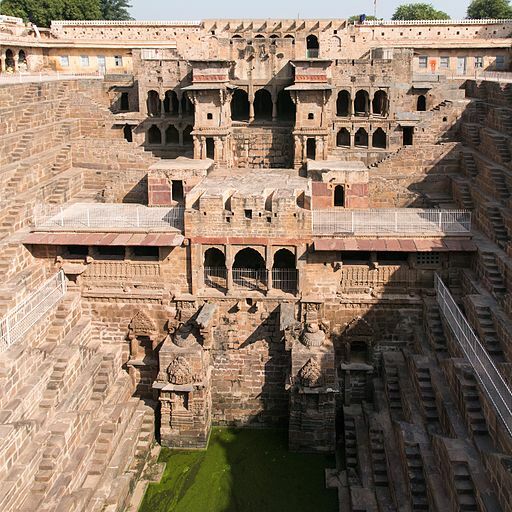 This step well is built in 3 levels and each level has surrounding walls with carved niches. This 14th century stepwell from Hampi is a celebration of symmetry. It was built during the Vijayangara period. In Karnataka, these step wells are known as “Pushkarini”. This beautiful step will with five diminishing stages was found during an excavation in 1980. It is located quite close to the colossal structure named Mahanavami Dibba. Even after being buried under the earth for centuries, there was not much damages to this structure. Lakkundi is a tiny town located near the Hubbali city in Karnataka. It is rich with temples and sculptures from the Kalyani Chalukya period. 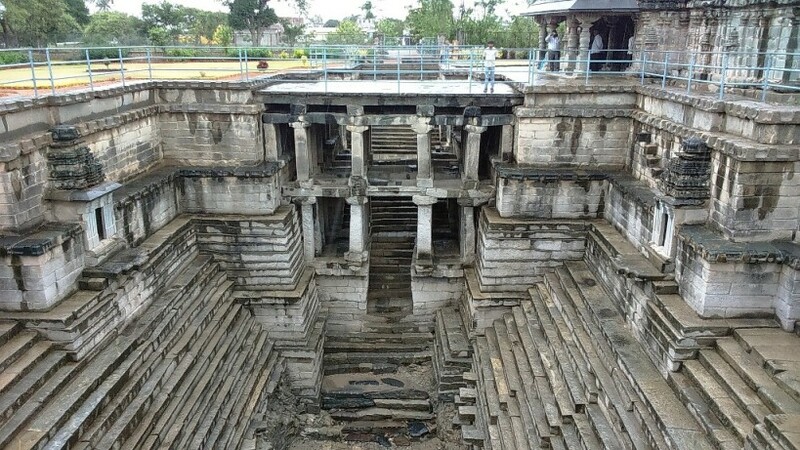 There is a very deep stepped well near the Manikesvara Temple in Lakkundi. It is called ‘Muskin Bhanvi’. Bhanvi is word used to denote the step wells in this region of Karnataka. This step well is believed to be from 12th century AD. This is again one of the intricately carved step wells from Gujarat. It was made in 15th century by the Sultan Mahmud Begada of Muzaffarid dynasty. 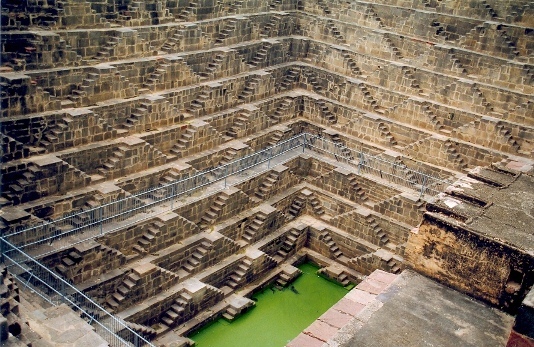 According to wikipedia, There are around 120 step wells in and around Gujarat. According to the local legends, there is a tragedy associated with this step well. Before the Sultan, this region was ruled by Raja Rana Veer Singh and he had a beautiful queen named Rani Roopba. The sultan conquered the kingdom and killed the Raja. The sultan also wanted to marry the newly widowed queen Rani Roopba. Surprisingly, she agreed - but on one condition. 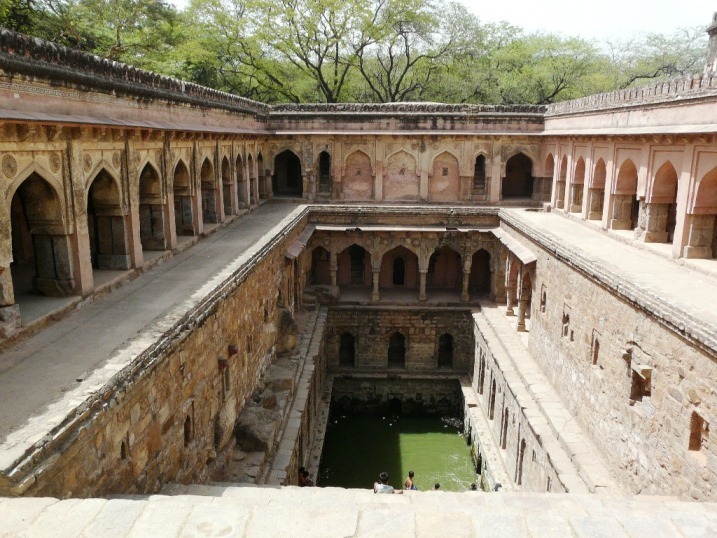 The sultan must first finish the construction of the step well that her husband started. Sultan was totally smitten with the Queen and readily agreed to construct the Adjal Vav. But when once the construction was completed, the queen jumped from the top floor into the well and ended her life. The locals worship her as a Goddess even now. The sultan, even though furious, allowed this marvelous construction to survive. This step well at Neemrana in Alwar district of Rajasthan would give you a vertigo if you look into it. It is an 18th century construction which is as deep as 9 storey building. In the arid planes of Rajasthan, finding ground water was more difficult than finding gold. It was built for famine relief by the local Rajas. It is such a colossal construction and definitely make a mark on your memory for ever! This beautiful step well is situated near the Sun temple complex in Modhera. Modhera is a small city located in the Mehsana district of Gujarat. The temple is quite ancient, built during the 1026-27 AD by the King Bhimdev of Solanky dynasty. However there is no clear information about the construction period of this step well. Leading to the step well, there is a beautifully carved domed door frame known as 'Kirti-Torana'. This ancient step well is located quite hidden in the Mehruli Archaeological Park in Delhi. It is belived to be built in 1506 by Daulat Khan under the patronage of Sikandar Lodhi. It is named as Rajon Ki Baoli, as it was used by the royal masons or Raj Mistries. All three sides of this step well is covered with colonnaded arcades. This step well has four diminishing levels. This majestic step well is now dry, lying there unnoticed. It was once fitting well for the kings! 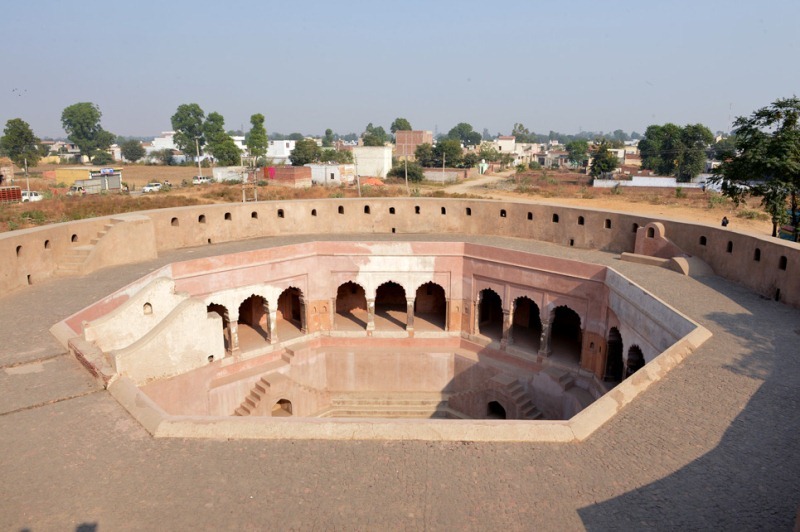 It is an octagonal shaped step well located in Farrukhnagar close to Gurgaon Haryana. It was built by a local ruler named Ghaus Ali Shah who was under the patronage of Mughal king Farrukh Siyar. It was during the 18th century. There are also a Sheesh mahal close by. This step well is also in a neglected state. 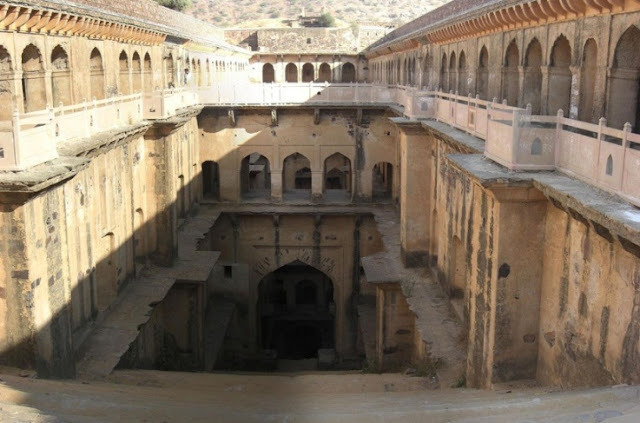 There is also a one kilometer tunnel connecting the Mahal and the step well. Legend says that the queen used this tunnel to reach the step well. Pan-Mina-Ki Baoli is located near the fort in the ancient city of Amber in Jaipur, Rajasthan. It was built in the 16th century. The symmetry of the stairs makes Baolis picturesque. The baoli has cris-cross stairs and a raised central platform. Great post! India is incredible.. 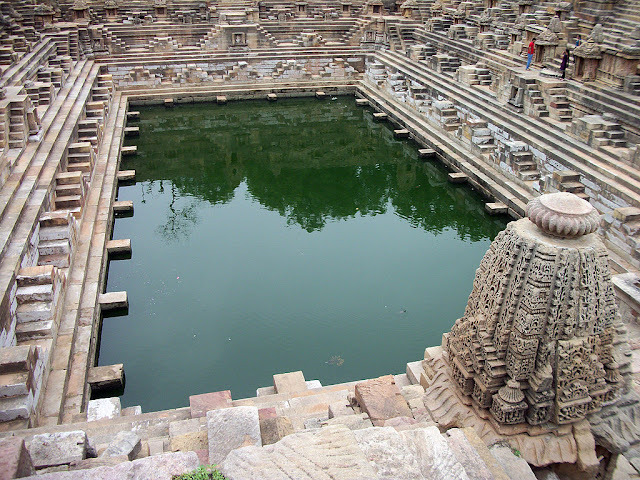 I've been wanting to go for ages and will hopefully get a chance to next summer :D I would definitely be interested in visiting Modhera sun temple step well! I've only hear about the water temples/wells but never actually seen how they look like. Magnificent! Some of them look almost like an optical illusion with so many stairs. And there are so many different places like this in India. Thank for sharing these beautiful photos and interesting information! It looks absolutely amazing! I love sightseeing such places rich in history and super pretty at the same time. :) Cool adventure, congrats! Nice architecture and it's amazing to know there are so many water temples in India!